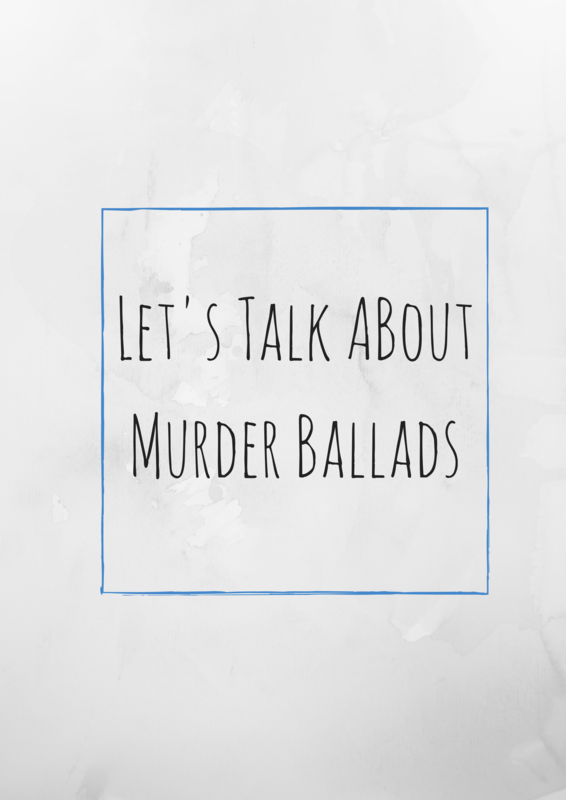 Since our next two songs fall under the folk sub-genre of “murder ballads,” it seems as good a time as any for a brief thought or two on the topic. Like folk songs, fairy tales are marked by violence. One need look no further than the Grimm Brothers’ “The Juniper Tree” to be convinced of the depth of their grimness and suddenly feel the surprise of gratitude to Disney for reworking some aspects to be more suitable for today’s children. I am very glad I didn’t, at three years of age, witness in cheery animation one of Cinderella’s step sisters slicing away at her heel to cram it into a slipper. Maybe such plot points aren’t suitable for child cinema, but I would argue that they needn’t be left out of stories. Child psychologists generally agree that children like even these darker aspects of fairy tales, and that they can be beneficial for their developing sense of morality and goodness. Bruno Bettelheim goes into great detail on this in his book Uses of Enchantment, which I thoroughly recommend. Children are still pure and innocent with very black and white interpretations of right and wrong. Because of this, they like it when wicked people get punished. Then too, it helps solidify their understanding of these concepts: deceitfully cut up your heel to pass yourself off as another woman, eventually get your eyes pecked out by birds. Message received. This phenomenon does not diminish as we get older, which explains why thousands tune in to the ever-grating voice of Nancy Grace, eager to watch her lambaste whatever inane guest is on to talk about some otherwise unheard of murder. Watching other people get in trouble is riveting. Maybe it makes us feel morally superior as we watch: my daughter would never be caught with that boy, would never party like that, would never… And we watch and judge and are entertained, and we can play it off as learning from the mistakes of others. We can argue that by televising trials we’re discouraging future crime. Right. So I think that’s part of what we see when there is death and murder in fairy tales and folk songs. It’s this weird intersection of cautionary tale meets juicy gossip. One of the main differences between fairy tales and folk songs though is that characters of fairy stories seldom have names: they are Cinder-girl or Prince or King. (Rumpelstiltskin and Baba Yaga are among a few exceptions.) That is part of their appeal to children too: it is easy to imagine that you are Prince. It is harder to dream yourself into the story of Hercules. But unlike fairy tales, folk songs often were written about real historical events. Names are often given, particulars included. In this way, ballads were and are records, musical accounts of true life murders. “Jesse James” is a great example of this, even giving the particulars of his death and naming his murderer. Our upcoming ballad of “Tiranti, My Love” is potentially based on a centuries old murder. Songs continue to serve this purpose today: Murder Ballad Monday, which recently joined Sing Out! Magazine, has broadened their discussion of the genre to include many more modern incarnations including Crosby, Still, Nash, and Young’s “Ohio” and Bob Dylan’s “Hurricane.” I’m waiting for them to write about Sufjan Stevens’ “John Wayne Gacy, Jr” – a contemporary murder ballad if ever there was one. For me though, I think murder ballads serve as part of the “ars moriendi.” To sing about a life cut short is to contemplate how short even the longest of lives are. We mourn often for twenty or forty or fifty years or so that might have been but weren’t, and it is hard not to feel in those moments a deeper sadness that we all die soon. I love songs and literature about death because they help root me in the present, in life, by reminding me that my death will come too and I must be mindful of time’s passing. All of that is to say, there are a lot of murder ballads in the Ballad Book. You can treat them as cautionary tales, or gruesome gossip you wish it wasn’t part of human nature to like, or you can let them sweep over you, sadden you, help your mourn your own inevitable passing. Or you can skip them all together and listen to Dueling Banjos and pretend that’s what Southern music really is. Pingback: Dear [Murder] Balladeer: John Jacob Niles and Forest Mountain Hymnal - Sing Out!